While back pain is a known and widely-studied issue in adults, its prevalence in school-aged children has received comparatively little scientific attention. Elementary, middle, and high school students most often carry backpacks that weigh enough to cause chronic back pain, poor posture, and even decreased lung volume. Recently, several studies revealed the truths behind childhood back pain and ways to mitigate it. Our Chiropractor in Overland Park wants you to be aware of the back pain your child may be suffering from. In another study involving a sample of 1540 metropolitan school-aged children, over a third of the children surveyed reported back pain. A third!! In addition to carrying heavy backpacks, female students, and those diagnosed with scoliosis, had a greater association with back pain. Children with access to lockers reported less pain. To my mother’s dismay, after telling me to “use both straps” all through high school, the number of straps on the backpack had little impact on the respondent’s answers. A few more fun facts from this study provided by our chiropractor. Children should take advantage of locker breaks and only carry items necessary for a couple of classes at a time. When lifting a backpack, children should crouch down and bend their knees, rather than curve the spine. While doing my research for this blog I came across these tips that I want to share with you. Look for backpacks with helpful features such as multiple compartments for even weight distribution, padded straps to protect the shoulders and neck, and a waist belt. If your child’s school allows, consider a roller pack, which rolls across the floor like a suitcase. If back pain problems continue, talk to your child’s teacher or principal about implementing paperback textbooks, lighter materials, or digital versions. If your child continues to experience back pain, contact your local Overland Park Chiropractor. It’s more common to be aware that chiropractic care and massage therapy can help adults with spinal discomfort, but they also can provide safe and tailored treatments for children. Always look for a board certified chiropractor that uses no-twisting, gentle techniques, as well as an experienced highly recommended massage therapist. Chiropractors can also recommend appropriate exercises to improve back strength, and additional advice on proper nutrition to build strong bones and joints, healthy posture, and more. 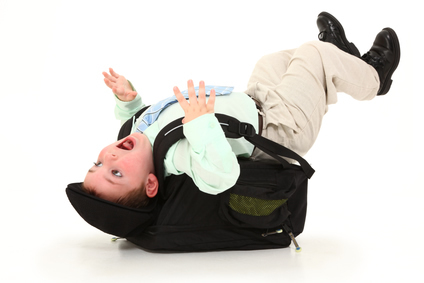 If your child is experiencing back pain from carrying a backpack, gives us a call in Leawood. Our chiropractors and massage therapist are here to help! Call 913-681-7757 to schedule an appointment today!